At the end of this month I'll be making my way to Raleigh, North Carolina to attend a conference called ScienceOnline2013, the seventh annual installment of an event that brings together "scientists, students, educators, physicians, journalists, librarians, bloggers, programmers and others interested in the way the World Wide Web is changing the way science is communicated, taught and done." I must admit to being both intimidated and excited by the prospect of joining this illustrious group for the first time. Although this isn't an enterprise that requires new clothes, I did wonder whether I might need to be equipped with a new title for the job. Once upon a time I considered myself a scientist, a physicist to be exact, but my efforts to put together a presentation on the recent Higgs boson discovery reminded me just how long ago that episode was in my career. Of course I am a blogger now - who isn't? - and I do blog about science, that is when I'm not blogging about movies and politics. I imagine myself being a science writer one of these days, but I'd feel more comfortable assuming that mantle once I had book under my belt. That's not going to happen anytime soon. Certainly not by January 30th. So, echoing the confusion of an erstwhile vice-presidential candidate, I find myself asking the question, "who am I? And what am I doing here?" What is ScienceOnline about and why is it a fit for me? ScienceOnline is a non-profit organization that facilitates conversations, community, and collaborations at the intersection of Science and the Web. The intersection of Science and the Web? That's pretty much my home address. 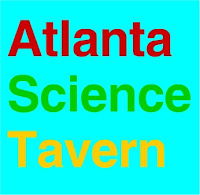 You see, I am the Director of a group called the Atlanta Science Tavern, Atlanta's premier grassroots public science forum, organized on Meetup.com, with over 2,800 members. We produce or promote several science-related educational or cultural events each and every month and specialize in bringing research scientists and science writers to an audience of science enthusiasts who just can't get enough of the stuff, especially when food and drink are involved. Our topics cover everything from The Manufacture of Glass in Ancient Egypt to Neutrino Astrophysics; from Mr. Jefferson and the Giant Moose to Global Climate Change Policy. Many of these talks have been captured as podcasts available free-of-charge from our iTunes library. Founded in June of 2008 by my friends Carol Potter and Josh Gough, the Atlanta Science Tavern began life as a science cafe in the tradition of Cafe Scientifique. But their decision to use Meetup.com as an organizational tool rapidly transformed what were to be informal, small-group encounters with scientists over beer or coffee into large public science presentations over dinner at our home base, Manuel's Tavern, routinely drawing over 100 people on a Saturday night each month. This has been an entirely Internet-fueled phenomenon, with easy discovery on Meetup allowing us to mobilize a vast community of under-served science lovers. In the last couple of years we have leveraged our Internet presence to promote events and activities hosted by other organizations and groups. This has led to a partnership with the Atlanta Botanical Garden, in which we help them to get the word out about their own summer science cafe series. Two years back we launched the very first Science Track at the Decatur Book Festival, the largest independent book festival in the country. It was a fortuitous result of our featuring Holly Tucker and her book Blood Work there in 2011 that finds me attending ScienceOnline2013, thanks to Holly's encouragement. Our collective Science Tavern gig as contributors to Holly's history-blogging website Wonders & Marvels has given us a new way to extend our reach to an even wider audience on the Web. The sky, it appears, is hardly a limit when it comes to expanding our program. Our Mars Landing Party the night of August 5-6, 2012, which included a five-speaker symposium streamed live around the world, attracted over 300 guests to the Georgia Tech Enterprise Innovation Institute, including people who traveled hundreds of miles from neighboring states, to witness the landing of the Curiosity rover. It also attracted the attention of The New York Times and CNN.com. Closer to Earth, we are currently organizing another big public event, the first annual Darwin Day Dinner here and are working to have February 12, 2013 proclaimed Darwin Day in the City of Atlanta. It's a challenge not quite on a par with Curiosity's "seven minutes of terror," but still fraught with some suspense as of this writing. So all said, although I'm still not exactly sure of the title I should adopt for this new enterprise - "science impresario" would be my dream - I am convinced that I belong at ScienceOnline. If that's where the intersection of Science and the Web is, then I'm there! It feels a lot like I'm going home. Finding a Home at ScienceOnline by Marc Merlin is licensed under a Creative Commons Attribution-NoDerivs 3.0 Unported License. Based on a work at http://thoughtsarise.blogspot.com/2013/01/finding-home-at-scienceonline.html . Welcome to the ScienceOnline community! I look forward to meeting you in a few weeks. I thought you yourself had coined the term "science activist," which I thought was apropos. Thanks, WhySharksMatter! I'll look for you at the conference. Louis, you're right, I do call myself a science activist - sometimes a science advocate. To introduce myself to ScienceOnline I wanted to come up with a title that would specifically communicate the kind of work that I do using the Web to organize and promote science-related educational and cultural events in the real world.